The software is designed to have all the features you need as easy to use as possible and reliable for day-to-day operation. If you install Palm Dictate you will quickly find it will replace your old dictaphone and, by using the internet to send dictations, will improve the turnaround on typing. 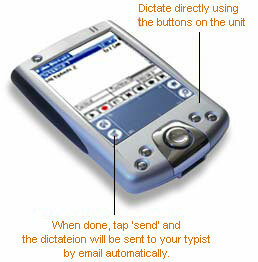 Record and playback dictation using the buttons on the Palm PC. For ease of use, operation is designed to closely mimic that of old style dictation recorders. For example, you record by holding down the record button on the side of your Palm PC. Release the button to stop. To continue from where you were press it down again. You can also playback, rewind, insert or overwrite as required using the keys on the front. Optional voice activated recording. When selected Palm Dictate only records while you are speaking.